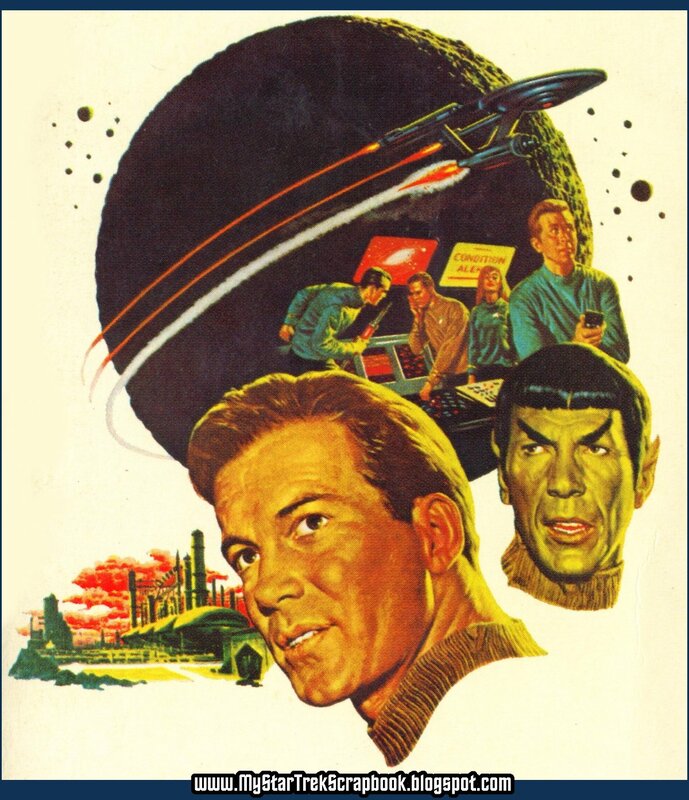 As I was mulling over what to post next on this blog, I began to realize that I had focused very little, comparatively, on the classic Trek novel covers, of which there are many. 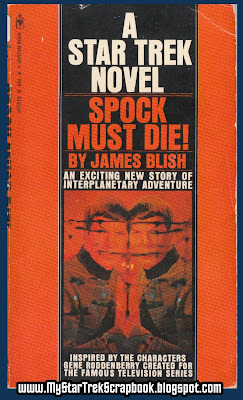 I decided to rectify that situation, by immediately starting to scan them in and post them, starting with one I had somehow missed up to this point, the first original novel that so many of us remember fondly: "Spock Must Die!" 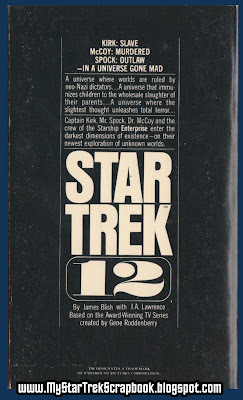 As a youth just entering my teens back in the early 70's, when I began to find the Star Trek novelizations by James Blish (and what an exciting time that was) I was always on the lookout for the newest one. I came into it a bit late, as by that time (1973) there were quite a few out already, (up to #8) so my discoveries weren't so much waiting on the next one to be printed, but the next one I was lucky enough to find on a bookstand somewhere. (Oddly enough, however, I did pretty much find and buy them in the order they were printed for some reason, over the next few years.) I was up to #3 in the series when I found "Spock Must Die" in the book spinner of the local drugstore where I lived at the time, and boy, what a day! 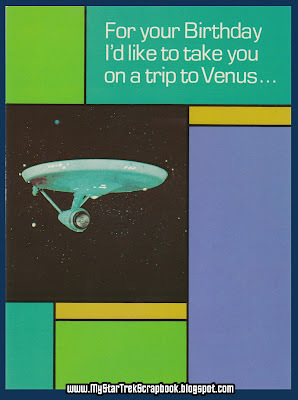 I mean, the mini-adaptations packed into the novelizations by Blish were exciting enough (they were my first introductions to the episodes, as in most cases I read them well before seeing them a few years later on the TV re-runs), but here... here was a NOVEL, a whole book on the show! Boggle!!! I remember thinking that it was an adaptation of an episode or two, before it sank in later that it was wholly original and not from a filmed show. I was still new to it all and in the exciting "wide-eyed discovery" phase of fandom at this point. 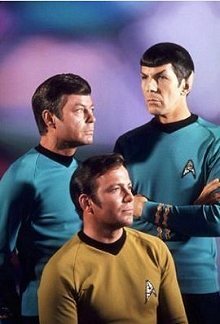 When I say that finding Trek material such as this was the most exciting thing that could happen in my life at that point, I am not exaggerating. At all. Nothing could compare to the thrill of finding a new book, or magazine with an article about the show, and I could ride on a high for days after doing so. Who needed drugs, or wild physical thrills, when such happiness could be experienced over something so simple? Even now, taking out these same books that I held in my eager fingers so many years ago, I am transported back to that time, and I vividly remember how each one made me feel. The flood of nostalgic feelings they trigger, and the memories they invoke, are almost as exciting to re-live now, as the books themselves were to me back then. They made my life more special, and the difficulties I went through were more bearable. I remember listening as I read to the Carpenter's song "Yesterday Once More" which was current at the time, and it is still one of my favorite oldies. I bought my first copy of "The Monster Times" about the same time. 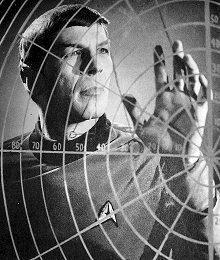 I hope that as I go through the process of scanning in the covers of the various classic Trek novels that came out from the 70's through the 90's (which is where I stopped collecting them after just so long), that the posts will stimulate your own memories... and that you will share them with me in the comments. Future posts on the various books will mostly feature the covers and not much in the way of reviews; most of them I haven't read in years, since reading them once when I bought them for the most part; and I would have to read them all again and invest too much time to do a proper review. But I hope you enjoy seeing the covers! 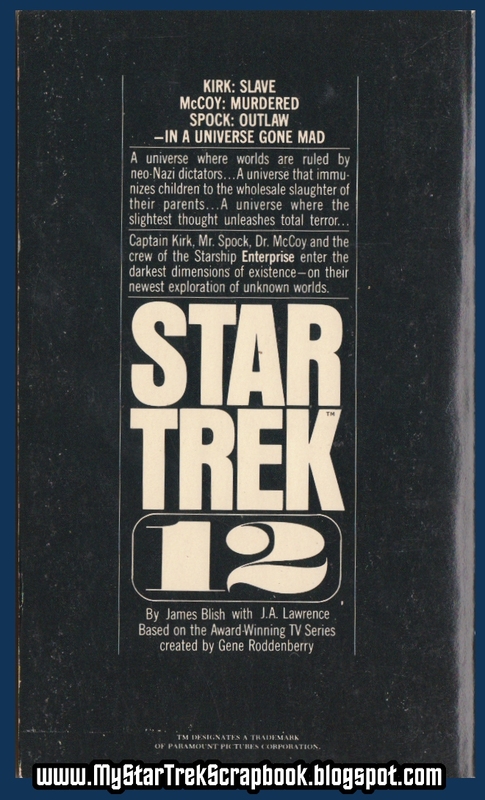 I've already scanned the rest of the Blish novelizations, which you can find using the "Blish novels" search tag. But I found that I had not finished, having omitted #12, and the above book. So, with this post, I finish all the Blish books. 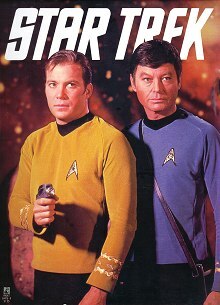 By this the time all the episodes were adapted, and I was wondering where I would get my Trek book fix afterwards. 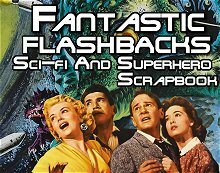 However, I should not have feared, for I had then begun to discover the big three "making of" books that were out (to be covered soon), and after that there started to be more original novels. 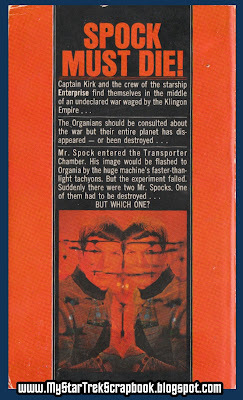 Below, the back cover with the blurbs about the episodes covered... it makes it seem as if each episode they visited a new universe where one condition ruled, rather than different planets in the same universe. I wonder who wrote these? 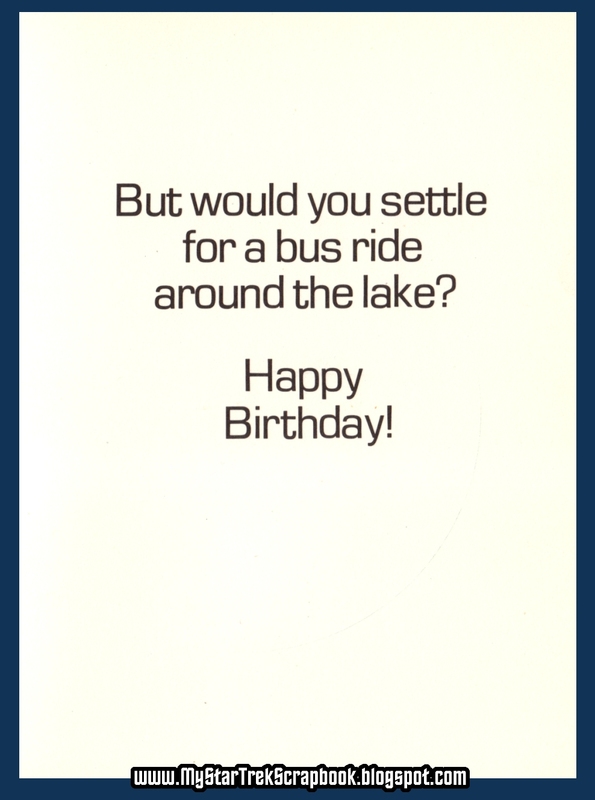 ﻿Bonus: the last of the Random House greeting cards from 1976, which I purchased from "Starship Enterprises" in Ft. Lauderdale, FL when I lived down there. 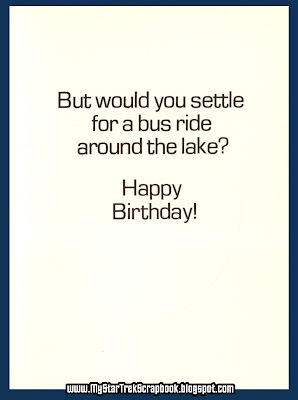 See the rest under the "greeting cards" label. 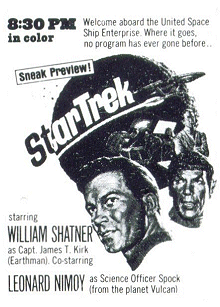 Spock Must Die!, simply as a title, has long been one of the touchstones of my Star Trek memories. You've motivated me to finally read it. 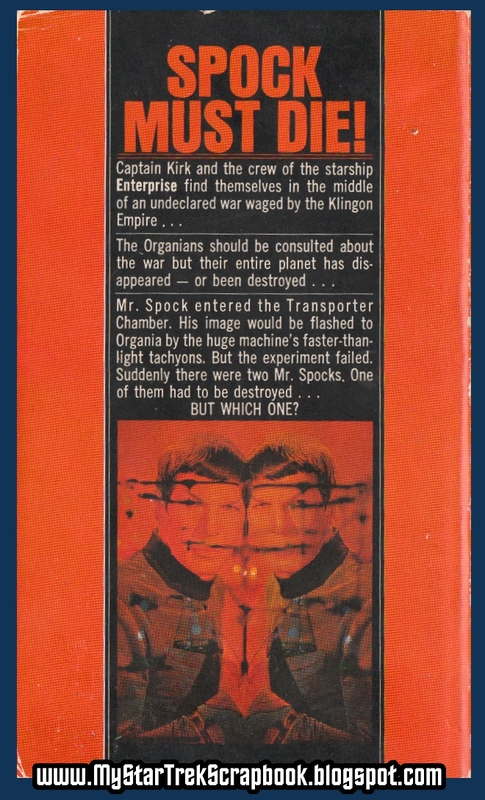 As far as the copy on the back cover of Star Trek 12, I'd assume the idea was to suggest as a whole these were all examples of the oddities Kirk and crew encounter. If there's something that it warps, it's the suggestion that the universe has just started providing examples of insanity in the universe. Maybe the copy writer didn't know this was a weekly occurrence for three seasons! Tony, thanks for commenting! 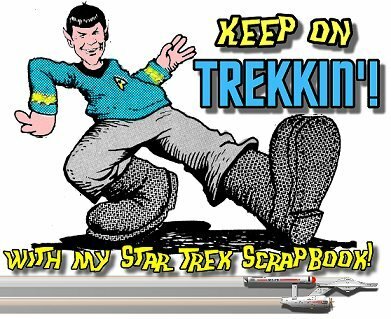 The book itself is a somewhat dry read, hardly measuring up to the standards of what one would expect from a more recent novel; it is more science fiction with a Star Trek veneer than a story that brings to life the characters we know so well. I think that most of it's appeal lies in our warm and fuzzy memories of what it meant to us at the time, being the first as it was, rather than being one of the better ones overall. It is worth a read because of it's place in history; but a first time reader now might now hold it in the same regard as some of us old-timers who read it as a youth! I agree with your assessment of the usage of term "universe" in the blurbs; but at face value it just always seemed a bit funny to me! Such was the style of all the Blish novel blurbs, and as such are to be loved. Ditto on everything you said about the Blish adaptations, Frederic! 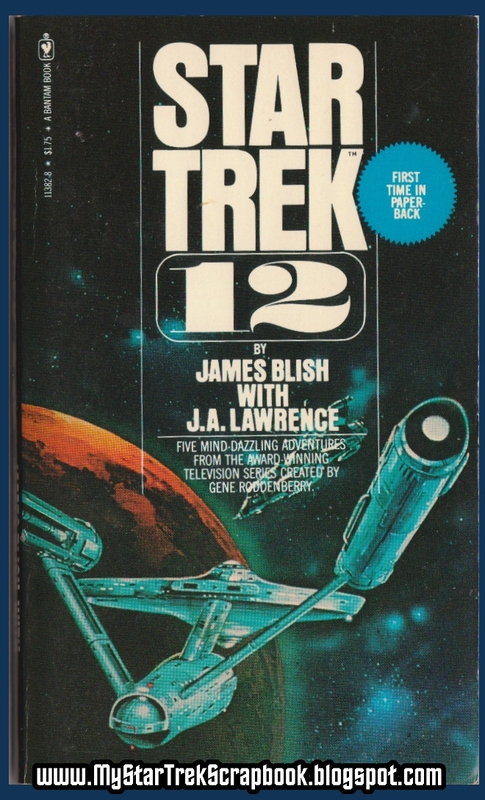 In the days before VCRs and DVDs, in the days when you might not see a rerun for five or six days, in a day when dad always seemed to have a chore for you to do when "Star Trek" was on, the Blish books were virtually the only way to get one's daily Trek fix (or even two or three fixes). Blish stands among my first "teachers" of how to write a short story. One of the things that bugged me in later years was the condensed way that Blish did the stories... but I guess he realized he would never finish them all if he didn't do a short version with 7 or 8 in each book. Wise choice if the goal is to cover them all... and as it turns out he died before he could. I had the same reaction to the stories, Frederick, thinking when I first read them that Blish could have done more with the tale. Blish, however, was forced to work within the constraints of the publishing company, which wanted 7-8 episodes per book but a book of less than 120 pages. Once the books become a financial success, the publishing company loosened up and let him write longer stories (Though the last four volumes in the series largely were ghostwritten by Blish's wife/widow). Given this, Blish in most of the stories demonstrated what a great writer he was as he pared 55-page screenplays to 9-10 page stories. One thing about the short stories was that they whetted my appetite for the real thing, and when I saw the episode there was a lot that wasn't in the books. I never felt that everything was "spoiled" for me having read the books years before-hand. I first got into Star Trek by watching TNG in the late 1980s, but very quickly I started checking out the James Blish novelizations from the elementary school library. 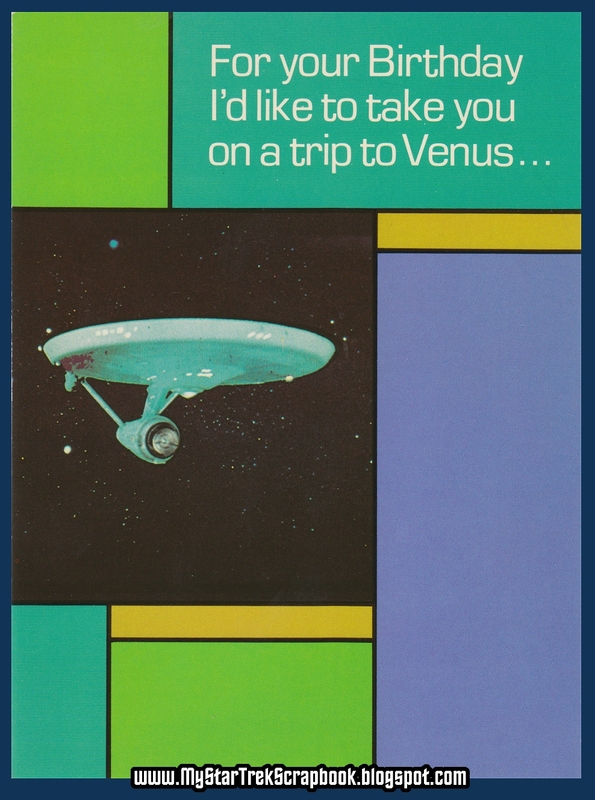 I also fell in love with Classic Trek through these novelizations. It was 6 or 7 years before I saw most of the episodes, and I was very surprised by how different many of them were when I did see them. I always loved the end of "Operation -- Annihilate!" where they destroy the planet that the Deneva parasites came from... and I was very disappointed that that part wasn't in the episode. 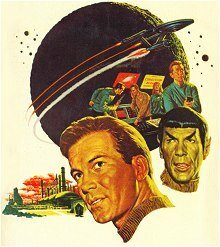 I didn't read Spock Must Die! until many years later. To tell the truth, I really enjoyed it -- it may be my favorite of the pre-Pocket Books novels. I love the way the Organians punish the Klingons for breaking the treaty. And I love that Blish felt he could resolve the conflict with the Klingons once and for all. 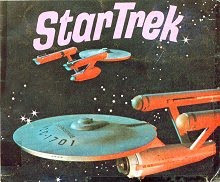 A lot of the charm of early Star Trek books and comics is that the authors didn't have to worry about working within the confines of a franchise, and were free to be creative. Thanks for commenting and sharing your memories of how exciting Trek was to you! It means so much to so many of us, but sometimes it was hard for me to believe that anyone else had the same love for it that I did. How wrong I was! 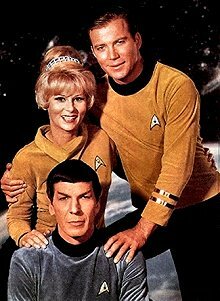 good to hear from you, and to find another that was introduced to Trek through the Blish novels. 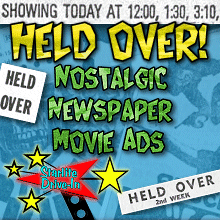 My first actual exposure to the show was through a Gold Key comic, but it quickly progressed to the books, as I knew they were more true to the show.